Reprint. Originally published: UK: Allen Lane, 2016. 'Edward was a man of considerable charm, who perhaps relied too much upon that charm to keep tensions within his entourage at bay' In 1461 Edward earl of March, a handsome, charismatic eighteen-year old, usurped the English throne during the first and most fierce of the Wars of the Roses. The years that followed witnessed a period that has been described as a golden age. 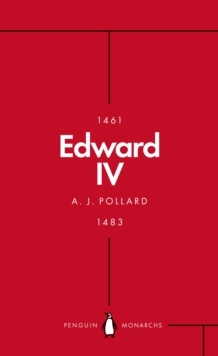 Yet, argues A. J. Pollard, Edward was a man of limited vision, who squandered his talents and failed to secure his own dynasty.